Lily is much better today. We were tagged from our friend Coco for a Paw Some Award from the purple hatter. Have a wonderful and purpley hatter day!! Please feel free to tag 5 of your blogging pals. The awards are just flying around these days! Congrats! Congrats on the award (hehehe, I always say that because I can't spell congratulations). 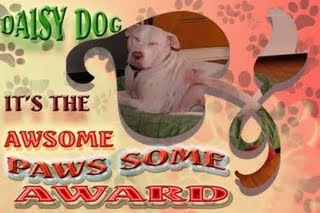 Congratulations on your pawsome award and thank you for sharring it with me. Sorry for tagging you again! If you feel like it, feel free to participate! Otherwise don't sweat it! Merci//thank you thank you...yes lots of awards. It is hard to keep track who has what..
How will you two share the award? I thought Lily didn't like to share?!? Thank for passing the award on to me! Sorry I am so behind on the thanks! Finally, back at the computer!